High Court Of Gujarat Has published Notification for The Recruitment of Bailiff / Process Servers Posts 2017. This is the most awaited examination from last year. This Exam is conducts in Single Paper of 100 marks as per syllabus. Join Our Mo.No. 98241 90996 in your whatsapp Group for Latest Study Material Updates. 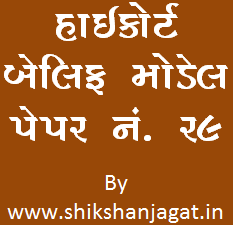 High Court Bailiff exam Candidates have best option for Online preparation via our website www.shikshanjagat.in. This Site Is for Gujarati Competitive Exams Like GPSC,HTAT, Police,TET,Clerk,Bank etc...Preparation. On this site you will find lots of material for Exam Preparation in Gujarati, Hindi And also in English. Keep Visiting This Site Daily to Improve your Knowledge. Here Is Model Paper No.29 For Upcoming Bailiff And Process Server In Gujarat High Court. This Is A practice paper for he candidates. Candidates Have to Solve This Paper Themselves. The answer Paper will Be published in the Paper.